John Dudley Stewart was born on April 16, 1918 to Harry McElroy and Mary Francis (Johnson) Stewart, at their farm home west of Sutherland, Nebraska. He attended a country school and then the Sutherland Public School, graduating with the class of 1935. He helped his father on the farm until March 1942 when he enlisted in the United States Army. Cora Mathers was born June 25, 1918 to John and Rosa Bell Mathers at their farm home southwest of Paxton, Nebraska. She attended the Paxton Public School, and graduated with the class of 1936. Cora worked at a local café, and Hehnkes Store, and was a Postal Clerk at the Paxton Post Office. Cora and Dudley were married in Abilene, Texas on June 6, 1942. After Dudley’s discharge from the Air Force, they returned to Sutherland, where he was engaged in farming with his brother, Harry Gene. Dudley was Past Master of the Sutherland Lodge #299 AF and AM, Past Patron of the Platte Valley Chapter #305, EOS. He was a member of the Sutherland School Board for a number of years and was an Elder in the Presbyterian Church. Cora was Past Matron of Platte Valley Chapter #305 EOS, Deacon in the Presbyterian Church, Member of the Genburnie Extension Club, and 4-H Club Leader. Dudley became seriously ill in February, 1962 with the influenza, and after an extended illness, died in the Sutherland Hospital, August 13, 1962. After Dudley’s death, Cora accepted a position in the Sutherland Post Office. She also worked in the North Plate Post Office. Cora was appointed Postmaster of the Sutherland Office, August 11, 1979, and retired October 28, 1983. Dudley and Cora had four children: Edyth Ann, born in 1947; Mary Jane born in 1951; John Dennis, born in 1953; and Carol Ina, born in 1955. Note: Cora Stewart passed away on Saturday, October 17, 2009. 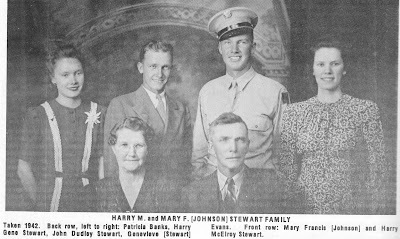 Harry Gene Stewart was born April 23, 1925, at the farm home of his parents, harry M. and Mary F. Stewart, northwest of Sutherland. He attended school in Sutherland and graduated in 1943. Throughout school he excelled in sports and singing. A bout with polio limited his sporting endeavors but his singing continues to delight all that know him. After graduation, Harry Gene joined his father in farming the home place and the Tracy farm west of Sutherland. He married Ruth Hazel Coker on January 1, 1947 at the Presbyterian Church. They have three children: Peggy Jean, born in 1948, Harry Michael born in 1950, and Timothy James born in 1955. Harry Gene is Past Master of the Sutherland Lodge #299 AF and AM. He has been for many years, and is currently Worthy Patron of Platte Valley Chapter #305, EOS. Harry Gene is an elder at the First Presbyterian Church in Sutherland and continues to live on the farm where he was born. Note: Harry Gene Stewart passed away on November 12, 1998.